What is around the corner… what will this new year bring? What energy does the new year bring? What do I need to shift in my life? Have the holidays have left you feeling lost or disoriented or are you looking for direction or insight into where to direct your energy & focus? Take advantage of Natasha’s New Year Special and book within the first two weeks of January and experience the grounding wisdom of the Futhark Viking Runes & Natasha’s Spiritual Counsel with this limited time offer! The runes, one of the oldest oracles to date, will reveal what your Spirit is asking for. With the support of Natasha’s intuition & psychic gifts, she will channel the messages you are ready to hear. Igniter and Mirror of Truth, Natasha reflects what your Spirit asks for. Are you looking for clarity? Searching for answers? A Rune Casting may be just what your Soul needs to uncover the answers to your deepest questions. The Viking Runes are some of the most ancient oracles, originating back to Norse mythology in the 5th century. The Runes allow for an intimate conversation between the self and most evolved Self, gifting the recipient with innate wisdom and self-reflection. 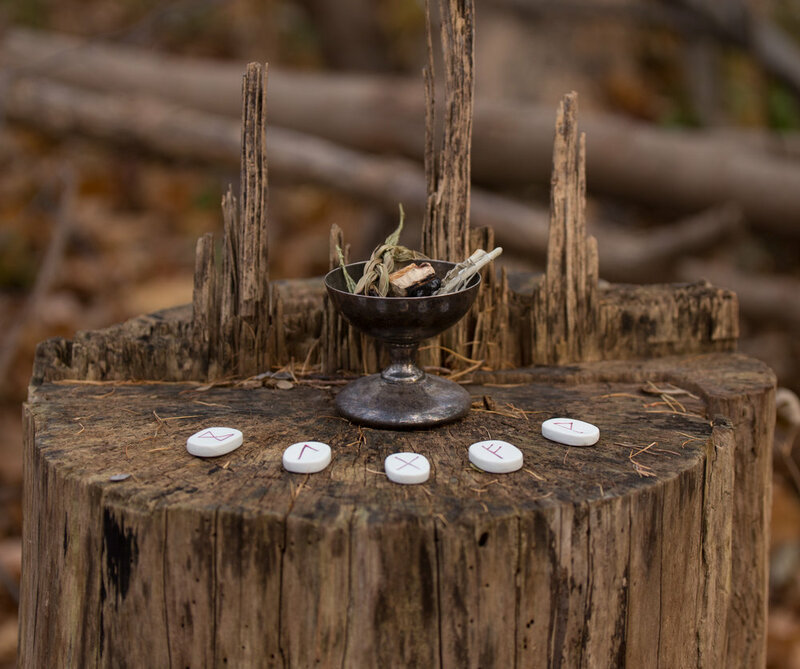 In this Intuitive Rune Casting session, Natasha will facilitate a dynamic rune pull, where she will break down each rune in its collective, revealing the overall theme of your casting. Rune casting is not your everyday “fortune telling” session, instead, the Runes are revered for providing you with wisdom held deep within your subconscious. Everything you need to know is already within you, the Runes will simply pick up the phone and dial a connection. You will leave your reading feeling more grounded and Self-directed. What is it that you need to know today? Listen to your body, is it telling you a story? Seek counsel from the Runes and uncover the wisdom, answers and insight within yourSelf! Who will benefit from an Intuitive Rune Casting? you are facing a situation with limited information. you feel like you have exhausted your own resources of insight. you are seeking counsel or direction. you are wanting to connect deeper with your own divine wisdom and most evolved self. you have a specific question in mind. Rune Casting and How it Can Help You. “Know thyself” is the motto of the Runes. The Runes are a teacher and a powerful source of guidance. They are not a fortune teller or a seer of all that is - they are simply a medium or a bridge, if you will - used to communicate wisdom between yourself and your Higher Self. When we pray, seek out information, or ask for what we need, we are exercising our own oracular abilities, reaching out to a Source - our Knowing Self - within. When you are facing a situation with limited information or you feel like you have exhausted your own resources of insight, seeking counsel from the Runes at this time could be most profound. And when we consult the Runes, it is our need that summons the energy of the Runes into sacred play. Rune Casting is a form of divination that, with the assistance of my skilled interpretation, can help you find answers to your deepest questions. You will be offered perspective and guidance, originating from your own Highest Self, and read from the Runes that are cast for you. It is important to note that this reading is not a definitive prediction cast in stone, but instead, a vision of possibilities. We are living in an age of radical growth and Self evolution. The lessons come faster and faster as our Souls and the Universe guide us into new spaces for growth and prosperity. You are your own guide, your own creator, and at the end of the day you determine the meaning or importance behind each scene and circumstance laid before you. With this, I will challenge you to step outside of the comfort in certainty and expand your mind to the perspective that nothing is too insignificant to inspire and nurture a moment of inner knowing or self-guided direction. No one knows exactly how old the Runes are. Rune-like symbols have been discovered in caves tracing back as early as 1300 BC, Runes and their symbols were painted on the shields of warriors on conquest, and references of Runes are mentioned in earlier testaments of the Bible. According to the perspective of the Germanic peoples themselves, the Runes came from no source as mundane as the Old Italic Alphabet. Oh no! They command that the Runes were not thought up nor invented. Instead, the tale goes on to speak of Odin - a widely revered Nordic God, father of Thor, and seeker of great knowledge - on a journey of self sacrifice and possible death. It was there in his withered state, that Odin spied the Runes with his very own eyes, shimmering and dancing in the wise waters of Urd’s Well. Here Odin scooped them up and became reunited with his own innate wisdom, bringing him joy and desire for self growing once again. When you book your 60 minute Intuitive Rune Casting with Natasha, you will be able to select your preferred mode of communication, be it Zoom, Skype, Facetime, or phone. Before your reading, it will be important to consider what it is that you are wanting to explore in your Intuitive Rune Casting. Do you have a specific situation, scenario, or relationship in question that you would like more guidance on? If you have a specific question in mind you may bring that forward in two different ways. When communicating with the Runes there is an interesting distinction between asking for an answer to a question and bringing forward an issue at hand . Here, asking the question, for example: “Should I quit my job?”, is much different than bringing forward to the Runes, “I have an issue with my career”. The distinction outlined is that of importance, whereas in answering the first articulation, you will simply get an answer. However, when you ask for counsel on an issue at hand you can actively participate with the responses you get and extract your own meaning and self reflection. If you’re reading this and thinking, “I don’t know what to ask,” please know you do not always need to have a specific question or issue in mind. It is common practice to approach the Runes with an open mind and heart and simply ask the question, “What do I need to know for my path now?” Trust in the Oracle’s response and know the casting will provide you with opportune and instructive play. Together, you and Natasha will create an energetic container for your reading. You’ll begin by closing your eyes, taking a couple deep breaths and centering yourself. Some prefer to light a candle and burn sage or palo santo to signify ritual and sacred space. Natasha will open up her channels and invite in any guides who wish to join this container and/or share any insights or wisdoms with you. Once you are ready, Natasha will ask you to share your intention and questions for casting, and together, you two will connect mind and heart to this theme. Here, Natasha will reach into her Runic bag and make contact with the stones, moving her fingers around, channeling your desire for casting, and willing the right stones to reveal themselves. Based on the questions you bring forward, Natasha will determine what Rune spread will be most appropriate for sacred play and exploration. Each Rune selected will be placed in its specific position in the pull. For example, when facilitating a 5 Rune cast, we will explore: the overview of the situation at hand, the challenge, the call to action required, the sacrifice, and the situation evolving. Here Natasha will walk you through each Rune, describing its qualities and position (upside down or rightside up), and then connect back to its significance in the collective pull and your curated theme. Following your reading, it would be advantageous to set aside some time for quiet reflection. You may want to put on some background music and allow your mind to wander, you may be pulled to journal, or feel like a nice warm bath as you process the insight surfaced in our session together. Let’s get started. Schedule your Intuitive Rune Casting now. Your Intuitive Rune Casting will include a personally curated rune spread. Over these 60 minutes, you will connect deeper with your inner knowing and receive the wisdom and direction needed at this time in your path. A recording of this reading can be provided upon request.